The saying goes, ‘you are what you eat.’ What that means when it comes to human cannibalism, who knows, but that practice is the subject of goremeister Eli Roth’s latest bloodbath, The Green Inferno. Taking inspiration from the Italian cannibal films from three plus decades ago and bringing it into the modern age, The Green Inferno is the thinking man’s splatterfest, a goriffic adventure with a message. Justine (Lorenza Izzo) is a college freshman in NYC without much direction until she encounters a group of activists led by the charismatic Alejandro (Ariel Levy). These activists plan on traveling to Peru to stop a greedy gas company from bulldozing its way through the jungle home of the natives who live over the reserves of natural gas. Once there, Justine and the newer members of the group realize they may be in over their heads, and that the whole endeavor may be far more dangerous than your average school field trip. After a horrific accident leaves them stranded in the jungle, the survivors are soon captured by the very natives they had set out to protect. They soon learn that these indigenous people have an appetite far more particular than beef or pork, and have gruesome ways of procuring their distinct menu. Make no mistake – The Green Inferno pushes its ‘R’ rating to the limit. It gets that ‘R’ for ‘aberrant violence and torture, grisly disturbing images, and more.’ It can be brutal to watch at times, but if you’re reading this far into this review, you probably already know if the movie is for you or not. While the acts of carnage on screen are gruesome and disturbing, it’s not pervasive throughout the movie once they kick in. There are plenty of moments of sheer dread in between as we wonder what’s next, and who’s next. There’s also a survival aspect as the captured students plot a potential escape and the possible means of achieving that. 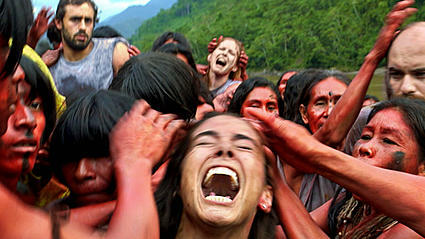 Eli Roth has made it clear he was inspired to make The Green Inferno based on his admiration for the wave of Italian cannibal films that came out in the late 70s and early 80s. In fact, if you stay through the end credits, you’ll actually get a brief history of those films. While Roth was clearly inspired by films like Cannibal Holocaust (there’s a nice homage late in the film, as well as a ‘per Ruggero’, the film’s director, at the end of the credits), he wisely opted to forego the ‘found footage’ approach so prevalent in so many other recent horror films. This is a straight forward movie, though Roth does make effective use of putting the camera smack dab in the middle of the capture sequence, allowing the audience to feel the terror the victims feel. Another aspect of Holocaust and Cannibal Ferox that Roth thankfully dismissed entirely for his film is the on screen actual killing of live animals those other films were notorious for. While we do see pigs and cattle, they get to roam free, and the young are kept with their elders. These cannibals certainly treat their livestock better than we do here in America, where cramped, dirty quarters are common, and the young are immediately separated from their parents. While we are on the subject of treating our fellow species humanely, the omnipresent thread throughout the movie is how we treat indigenous people when they stand in the way of natural resources that can be drilled, mined or logged for profit. Whether it’s Chevron destroying the jungles of Ecuador or Exxon polluting the water here in New Jersey, greedy companies have always found ways to exploit the environment in the name of short-term profit. It’s hard to believe that not much has changed since American settlers all but wiped out the Native Americans and the bison they depended on. The irony in Roth’s film is that it is the supposedly good-hearted people with the right intentions that are subjected to horrors by those they were looking to help. And the audience is torn between rooting for a tribe with a taste for human flesh or those out to wipe these natives from their homes and way of life. It’s hard to know whether the natives’ distinctive tastes are common practice or if they’re only imposed on those who would do them harm. Like the elephants’ increased aggression towards humans in Africa after years of poaching, it may very well be the latter. As for the film, the cast, made up of mostly unknowns, is excellent. Lorenza Izzo (Roth’s wife) makes for a very appealing lead, and does a great job of portraying everything from empathy to utter terror. SyFy fans may recognize Magda Apanowicz from her roles in Caprica and Continuum. 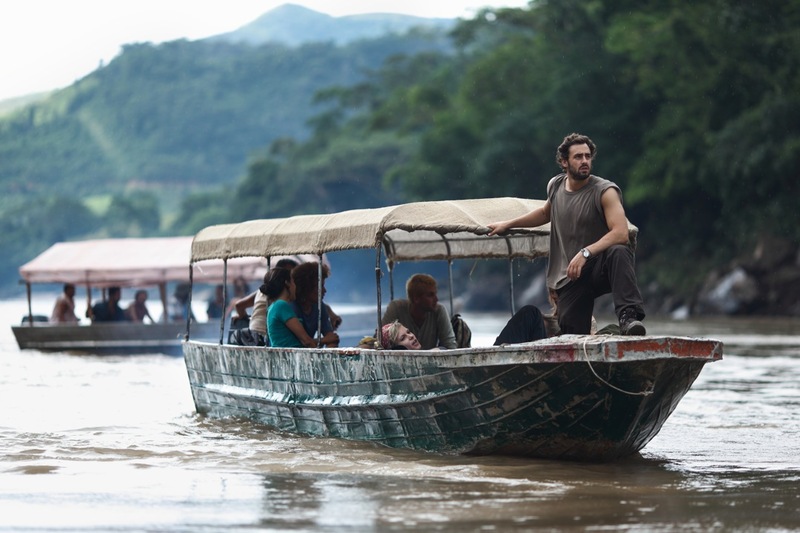 Shooting the film in the actual rainforests of Peru and Chile, Roth imbues his film with an authenticity that makes one realize there are some very remote and inhospitable places in this world. And using a genuine Peruvian tribe that had no previous knowledge of what a movie even was certainly gives the film a sense of realness one couldn’t get from casting actors in the roles. Also of note is the superb cinematography by Antonio Quercia and the rousing score by Manuel Riveira. The Gore 4 is glad to see Eli Roth invading our theater screens once again. With his soon-to-be-released Knock Knock, starring Keanu Reeves, and his upcoming megasuarus thriller, Meg, Roth looks to add to his growing resume of horror credits. So grab your popcorn and nachos, and set them aside for later. You may not want to eat much while watching others do the same on screen in the goretastic The Green Inferno. The film sounds like a real winner!!!! I used to love those movies and actually own many of them. The review was very well written and really makes me want to go now!!!! So is this a must see in a movie theater or a wait for Netflix movie? I am still undecided. I’d say definitely see it in a theater: 1, To experience it with an audience. 2, To support hard-R theatrical horror releases. and 3, It just looks better on the big screen, from the lush jungles to the carnage and mayhem. So many horror movies get very limited, if any, theatrical releases, other than the bigger studio films, so it’s great when something like The Green Inferno hits the big screen. Plus, we’ve had to wait awhile for this to be released due to distributor issues, so why wait any longer? It may not show up on Netflix or wherever else for quite some time. So wait? If you are what you eat then does that mean I’m a chicken? These natives seem like they have the right idea! 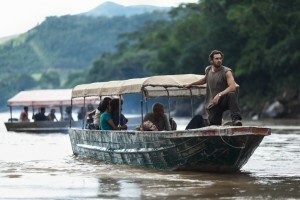 I think it is interesting how the filmmakers correlated environmental activists with flesh- craving indigenous people. We get to see both sides of the main protagonists and antagonists. I feel like this is one of the current horror movies that will go down in history! Just as “The Thing” did in 1982, “The Green Inferno” will most likely be one for the books. Very well written review, I can’t wait to watch it! Yes, as civilization, development and the search for resources continue to encroach on indigenous peoples, this issue will give this movie added weight. It is more than just a gorefest. 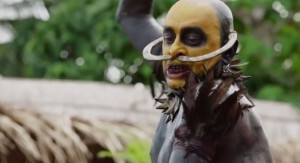 While few movies can, or will, ever compare to The Thing, I think The Green Inferno will stand the test of time and could one day be considered a horror classic. Jurassic World 2 trailer is 2 awesome!